• ❃ • ❋ • ❁ • tanglebucket • ✿ • ✽ • ❀ •: MERRYWEATHER. Hi friends! Long time no blog. 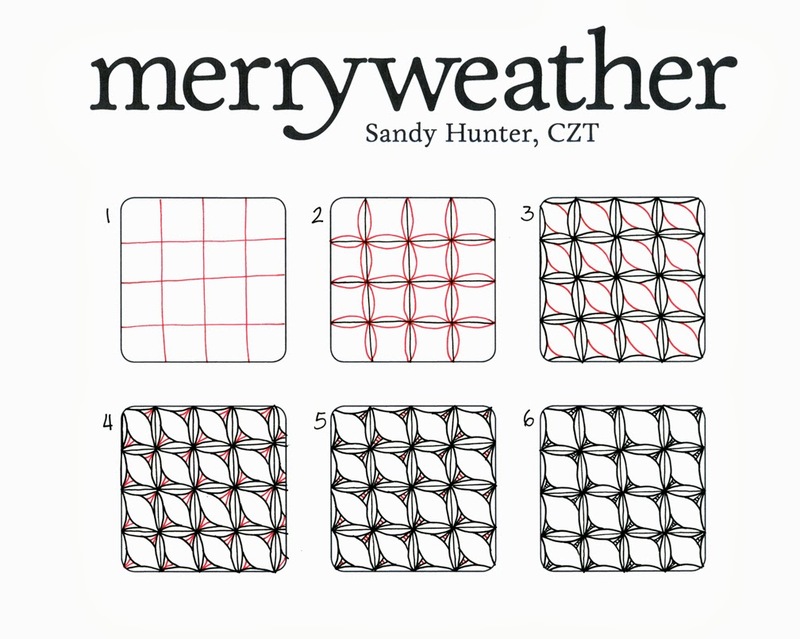 Merryweather is a new Bales-based pattern I've been funning around with. Hope you like it as much as I do... I uploaded a monster pic so you can click on the image and see the details. • Some patterns look ok with a wonky grid, but this isn't one of them. Try to get your lines evenly spaced. Draaaw sloooowly. * When in doubt, use a finer pen. There's a lot of teeny detail here that can get lost if the lines are too thick. • In step 4, it's easier to control the spacing of the lines if they are drawn from the curve to the middle instead of from the middle outward. 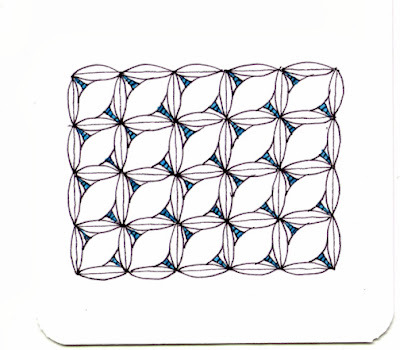 Same goes for the teeny lines in step 5: draw from the outside toward the middle. • If you make your curves too wide in step 2, you will lose some of the room you need to add the details in steps 4 and 5. 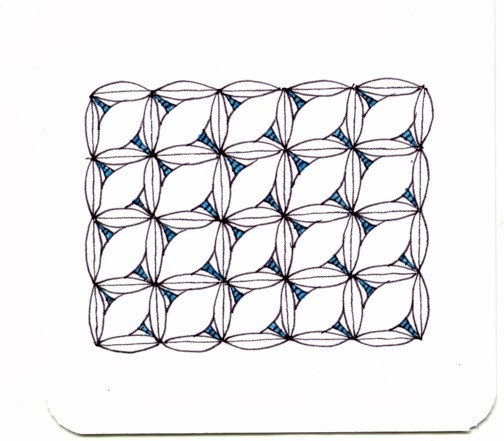 • When you draw the ( )s in step 3, you're not drawing from one 'intersection' of the grid to the next. Only halfway, from the fattest part of the curve. ...and one with another variation of the pattern in it. awesome, sandy! thanks! 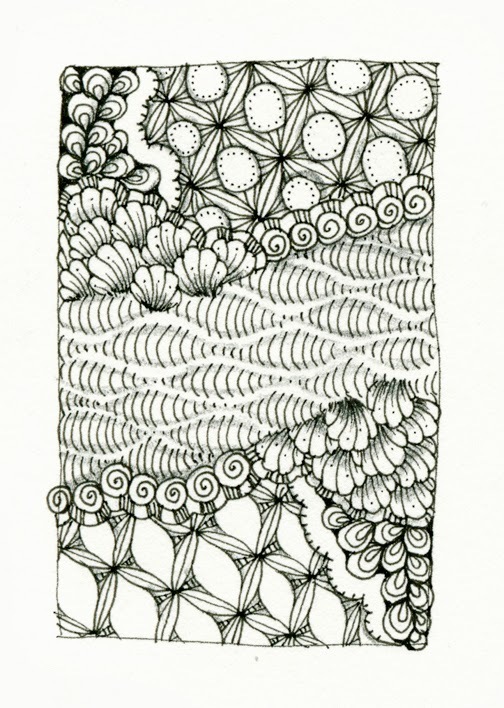 i'll be playing with this before i go to sleep tonight :) it's really a beautiful tangle. Splendid tangle, Sandy! Thank you for the clear step-outs, tips, and fabulous examples if Merryweather in action! 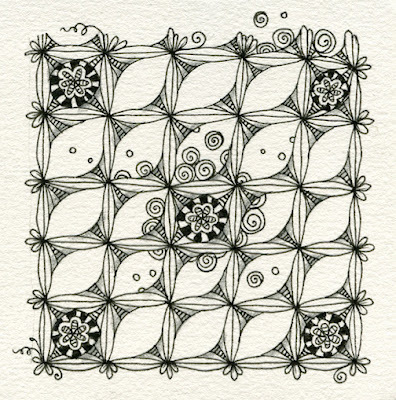 Really like this tangle. Thanks too for the tips on how to tackle it. LOVE the name! LOVE the tangle! Great job! Very nice new tangle. And I love the name you chose! Well done! PS - also love your blog background! Wonderful! Found you through a little lime/Helen Williams (thanks for the link through Helen!). I'll be playing with this today for sure! Thanks for sharing! 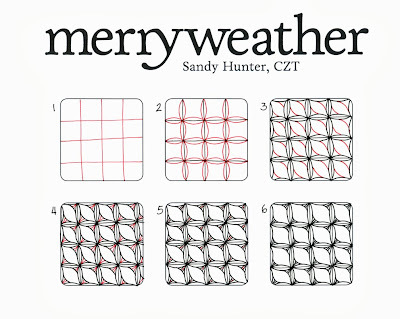 Oh super, I will definitely have a tangle happy merryweather day playing with this fun tangle! This is a beautiful pattern. Bales is one of my top ten go-to patterns, so I look forward to playing around with this one =D.